The implementation of the 10/8 rule, which allows Liga MX sides to use 10 foreign players in a match day squad, caused plenty of controversy. Many fans and pundits felt that allowing the usage of more foreign players would reduce the number of opportunities for young Mexican players in Liga MX, to the detriment of the national team. This was just a theory though, and FutMexNation’s Tom Harrison wanted to put this theory to the test. 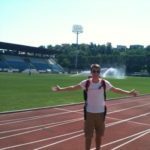 The FutMexNation study looks at the previous 10 Liga MX competitions, except for the 2014 Clausura, as no accurate data could be found for that tournament. For each competition, the total number of U-23 Mexicans used was calculated, as was the total number of minutes received by U-23 Mexicans. Both totals include data from all teams in Liga MX during the studied season. Total number of minutes received by U-23 Mexicans is a better indication of how many opportunities young players have been given, as the total number used can be skewed by players appearing for very short spells. Please note that a player is counted as Mexican if they are eligible for the Mexico national team. Some of the players included in the data have represented countries like the US and Colombia at youth level, but could still play for the senior Mexico team. 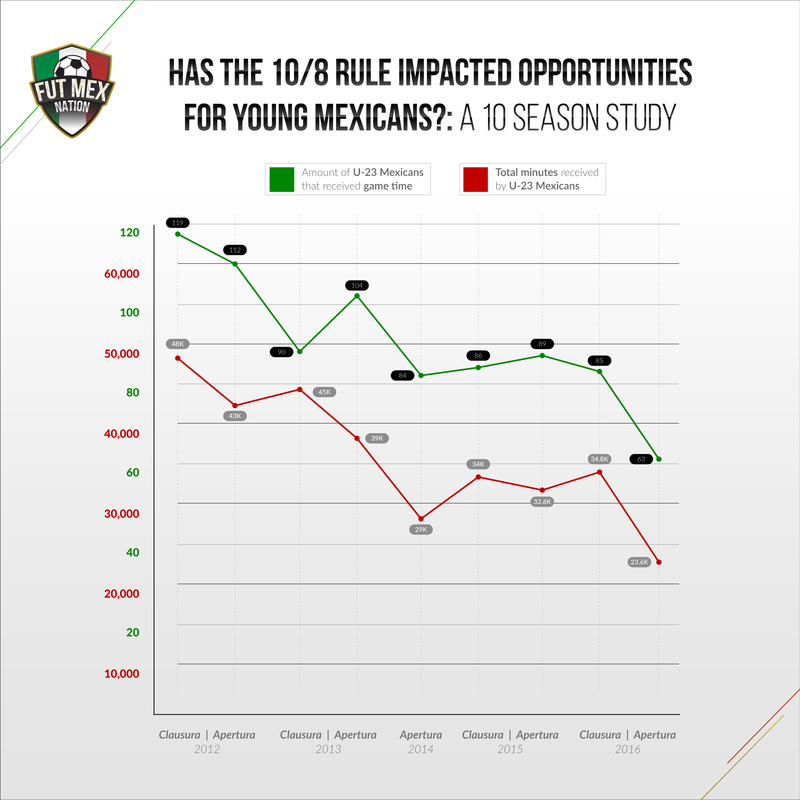 The graph clearly shows that opportunities for young Mexicans in Liga MX have decreased over the past 10 seasons. Both the number of U-23 Mexicans receiving game time and the total minutes received by U-23 Mexicans have approximately halved over the period studied. During the 2012 Clausura around 48,000 Liga MX minutes were given to U-23 Mexicans. This figure dropped to roughly 23,600 in 2016 Apertura. 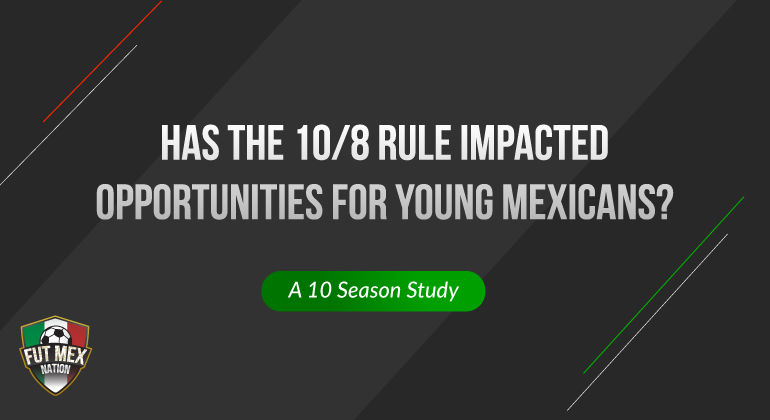 The largest drop in both aspects studied came with the implementation of the 10/8 rule at the beginning of the 2016 Apertura. The number of U-23 Mexicans that played in Liga MX fell from 85 in the 2016 Clausura to 63 in the 2016 Apertura. This drop came after 4 seasons of stability, suggesting that the 10/8 rule was the key factor in the large fall. Total minutes received by U-23 Mexicans also saw a major drop between the 2016 Clausura and Apertura, from approximately 34,800 to around 23,600. At first glance, these statistics appear gloomy for Mexico supporters. Less minutes for young players will logically lead to a smaller pool of players to choose from, and therefore a weaker national squad. However, the question of quality v quantity must be addressed. By loosening restrictions, and allowing more foreigners to play in Liga MX, the standard of Liga MX should increase. Mexican clubs now have more options when building their squads, which will logically result in higher quality teams, particularly when most Mexican sides are strong financially in comparison to their South American counterparts. Liga MX clubs currently boast internationals from all over South America; including Argentina, Chile and Colombia, as well as a certain Frenchman. An increase in quality would be fantastic for the Mexican youngsters that are able to work their way into starting line-ups on a regular basis. Regularly facing quality opposition will aid their development. Not only would this mean players aren’t held back as much by wealthy clubs that are unwilling to sell to Europe, but also the step up in quality to major European leagues wouldn’t be as large. The quick and impressive adjustments to European football that Marco Fabián and Carlos Salcedo have made suggests that Mexican players may already be benefitting from a stronger domestic division. In line with economic theory, reducing protectionism- in this case foreign player restrictions- can also force higher standards. It’s now harder for young Mexicans to make it in Liga MX, which may lead to youngsters working and training harder than before, and youth systems improving their coaching standards. Mexican players and coaches have been criticised in the past for being too comfortable, with Enrique Meza one critic. Increasing competition by reducing restrictions on foreign players may be the best way to reduce this comfort. History shows that Mexico hasn’t improved much whilst having much stricter foreign player rules. El Tri fans have had to suffer 6 consecutive defeats at the World Cup round of 16, and Mexico have never won a World Cup knock-out match away from home. It could also be argued that it’s too early to properly judge how the 10/8 rule will impact opportunities for Mexicans in the long-run. One season’s worth of evidence isn’t much, and other factors may have affected the size of the drop in minutes for U-23 Mexicans. Moreover, the age cut-off could have had a major impact on the results, and some may disagree with describing U-23’s as ‘young Mexicans’. This age was chosen as it’s the Olympic cut-off, but choosing to study U-22’s, U-21’s or even teenagers only may have produced completely different results. In summary, there’s been a significant drop in U-23 Mexicans used and minutes for U-23 Mexicans between the 2016 Clausura (and the seasons before then) and the 2016 Apertura. This suggests that the 10/8 rule has, as suspected, reduced opportunities for young Mexicans. However, the question of quantity v quality must be addressed. By reducing foreign player restrictions Mexican teams are increasing their player pool available to them, and therefore sould be increasing the quality of Liga MX. This, in turn, is helping the young Mexicans that do break into their first-team. How this will impact the quality of the Mexico national team in the long-run is uncertain. Only time will tell whether or not the 10/8 is a positive or negative move for El Tri. To finish on a positive note, Liga MX do seem to be willing to adapt depending on how successful they deem the 10/8 rule to be. When announcing that the 10/8 will be adjusted to a 9/9 rule for the 2017-18 season, Enrique Bonilla said, “the committee of sports development has the mission of punctually analysing how this rule develops and what benefits or damage it creates so we can adapt and improve it”. Hopefully a system which facilitates the growth of Liga MX and El Tri, without discriminating, will be found.